Cavechat.org • View topic - How to care for things. I wrote these few paragraphs during my most recent Virginia caving trip. We had just come back from a little cave I had found, and my thoughts swirled for a few hours as I tried to sleep. So I got up and found a pencil and rambled my way through one of the edges of the topic of cave conservation. It was an evening high on feeling and probably too short on knowledge, and night-time feelings are too-often revealed as silliness in the daylight. Still, I believed that there were some well-founded ideas here, and I submitted this material to Val Hildreth-Werker for the upcoming conservation issue of the News. After more thought, I realized that there were too many flaws, too many missing pieces, and too much potential to hurt feelings. So while I asked that it be removed from consideration for the News, I will, as promised in my trip report thread, share it here. In acknowledging the potential to hurt feelings, I do not mean to be incendiary by going ahead with posting. I have only been honest, and have tried to be thoughtful. On the topic of flagging, I ask for honest and thoughtful insights, feedback, and rebuttal. I've gone round and round with myself about this, and have yet to really land on anything. I have thought before about the need, since we have the ability, for photo-documentation of new caves. Tonight, I feel more strongly than before that this is a real need if we wish to call ourselves conservationists, and this brings to mind a whole string of thoughts on the subject. I do not wish to call myself a conservationist, usually, since conservation is widely understood to be something that I find hypocritical, illogical, and small-minded. Still, I am one in the sense that I believe that things of value should be protected from wasteful depletion. The relative values of things are not always evident, and therefore must be determined individually or societally. History has shown that these determinations, whether made in greed or in honest ignorance, were often made in error. This is an endlessly complex subject that I know too little about, and so I will try to stick to the issues that involve cavers. First of all, how involved can cavers be in conservation. In their role as cavers, I don’t think very much. Unless we call the personal avoidance of gross destruction conservation, there’s not a whole lot we can actively do. To understand what we can do, we must identify things of value that we wish to protect. Here are just a few. Animal life. In the course of routine travel through the cave, we are not likely to cause significant harm to animal life. As far as some cavers are concerned, bats and salamanders are The Cave Animals. We can make sure to behave with care around hibernating bats, and the NSS and other caving organizations do a good job of reminding us of this. They say much less about the protection of tiny cave animals, which, while interesting to some of us and sometimes valuable to scientists, are not nearly as endearing or photogenic. This is society determining relative value. Even so, we will not threaten the existence of entire species or deprive science of specimens, probably no matter what we do. Some individual living things will be killed by us as we move through the cave. Probably this happens more often than we realize. If we are uncomfortable with this sacrifice, we can stop caving, and reserve our incidental killing for above-ground creatures… but we are cavers. Historical and archeological artifacts. While I am fascinated by these things, I don’t know very much about what threatens them, or how to take care of them. I would guess that very many artifacts have been destroyed by curious tampering or lost to would-be researchers and interested observers through selfish removal. Certainly some have been covered in graffiti. If this is the case, our role in the conservation of this resource is a simple one: Don’t mess with stuff. Be observant. Except perhaps in rarely visited or rediscovered caves, a careful caver is very unlikely to destroy artifacts by accident. Aesthetic resources. Probably these are most often speleothems, but there exist in caves a great variety of things that are visually appealing. Again, we conserve mainly by leaving things alone. This can be a challenge when moving through dense formations, or when making repeated transitions from muddy to clean floors. Carefulness, and planning, and sometimes restraint are needed. Yet again, and unfortunately, the need for extreme care diminishes as visitation increases. The accidental breakages have already occurred and inevitable trails are already in place in most of the caves visited by many cavers. One confusing method used to “conserve” speleothems is to barricade them behind flagging tape. This behavior either misses the point entirely or is more ambitious in its scope than I am able to appreciate. Do flaggers not realize that speleothems are an aesthetic resource (that is, that they are valuable only because we think they are pretty)? And that protecting them from being diminished through accidental breakage by intentionally diminishing them with unnatural and ugly flagging is both pointless and contradictory? As I said, it is possible that flaggers have the “long-term” integrity of pretty things in mind when they uglify them. But I am uncomfortable with this idea of saving things “for future generations” by losing them to ourselves. Giving away, certainly, a present, in exchange for an uncertain and almost definitely unappreciative future is a sacrifice that I, maybe in selfishness, do not wish to make. Still, I could at least respect such an idea if it was a proven fact that flagging protected anything. I repeat, the thing that enacts real conservation, and the thing that will protect speleothems, is responsible behavior, and responsibility is not dependent on flagging tape. If flagging is unreasonably placed it will be ignored, even by a responsible and caring caver. If flagging is well out of the way, it will serve no use to the responsible and caring caver. Flagging will mean nothing to a vandal. So why do we do it? Maybe in an attempt to demonstrate the value that we place on speleothems. But this is a misguided and, I feel, selfish way to announce our righteousness. And so conservation for cave tourists (which must make up the majority of “cavers” or NSS or other caving club members) is mainly a matter of not intentionally destroying things. The only active way they can participate in it is by offering a kind and informal education to those who have not yet learned to care for cave resources. This does have value, and it is fulfilling to see our concerns reflected by new cave explorers, or old cave explorers who demonstrate a willingness to adjust their behavior. There is another thing we can do, a thing that the NSS has done too little to teach; therefore, that we have done too little to teach ourselves. This is for us to recognize and fulfill our responsibility toward virgin caves. Perhaps the negligence of the NSS is due to the fact that relatively few cavers are involved in the exploration of virgin caves. Perhaps the, “…nothing but footprints” mantra is too much exposed as inadequate where such exploration is concerned. Whatever the case, here is the issue as I see it, along with a few ideas about what to do about it. A virgin cave can only be seen once. If it is sufficiently narrow it can only be seen by one person, the one in the lead. Unlike the above-ground landscape which can heal many of the wounds we give it with remarkable speed, and which brings us an ever-changing display of beauty and activity no matter how still we sit, the cave is a fragile vision thousands of years in the making. And it is a long, dark, skinny vision that we must enter bodily if we wish to see it. It will not bring anything to us. Of course, there are caves that can be explored while leaving virtually “no trace”. I am not talking about these. I am talking about the sort of cave that my brother and I surveyed tonight. This small, unreported Virginia cave was, beyond a pit 100 feet from the entrance, virgin. Though not a spectacular cave, it was pristine and profusely decorated. The walls were in many places covered in flowstone and enormous and delicate “popcorn” and “coral”. The floors were alternately clean rock, ancient and undisturbed (and incredibly sticky) sediment, and flowstone. In order to explore the cave we had to touch and walk on and climb on these things. We were careful. We went slowly. We followed each other’s footsteps. In one place we carried our shoes. And we broke things. We got mud on the walls. We left footprints, and not the kind of footprints, I hope, that the NSS deems to be the acceptable mark of the good caver. These were hideous, violent, glaring footprints. Footprints that changed the cave more in six hours than it has changed, probably, in the last six centuries. As we chimneyed across a canyon, the tinkling of thousands of bits of falling cave coral announced our movements. Sliding through a gap between stalagmites, we smeared them with our muddy bodies. Our conquest of the cave was a funeral march. The wounds we gave it will not heal. As a virgin cave, it is no more. Make sure to understand the gravity of what you are doing. You are claiming something that can only be claimed once. To do so without appreciation, without reverence even, is a waste unforgivable of anyone claiming to be a conservationist (which I hope I’ve made clear is simply a decent, caring, thoughtful, responsible person). Being aware of the permanent effects your actions will have, make real efforts to minimize them. Do not conclude that since there is no way to avoid marring the cave, you do not have to be careful. Do not allow, for example, the fact that you have to remove one or two fine stalactites to result in a negligence of care around lesser speleothems. Try to leave things in a state that will allow future visitors to imagine, or almost imagine, what the virgin cave looked like. Anyone can go slowly, follow each other’s footsteps, or sometimes carry their shoes. Other ways to reduce impact include secrecy and gating. You as the original explorer may have to be personally involved in deciding whether or not these are appropriate. My own feelings on such methods are deeply conflicted. However, it must be admitted that they have, sometimes along with caring stewardship, been instrumental in the keeping of some caves in near-perfect condition. I have concluded that if the primary resource of a particular cave is its aesthetic beauty, and if that beauty can reasonably be expected to be threatened otherwise, then by all means, hide it or gate it. Surely a beautiful cave seen by a few is more valuable than a ruined one seen by many. Photograph the cave. This is much easier now than in the recent past. If you do not photograph the virgin cave, no one else will be able to. This is especially important in areas that will be most affected by travel. Many wild “tourist caves” have areas celebrated for beauty that no longer exists, having been destroyed by those flocking to see it. These areas eventually become nothing more than names on a map, and unless photographed, are lost. It is possible that good photo documentation should take priority over traditional survey, which anyway is too often nothing more than an ego-driven means for explorers to lay claim to their finds. It is certain that photographs should be highly valued by state cave surveys, and liberally included in a cave’s file. Where possible, plenty of photos should accompany the publication of a new cave map, or even be present on the map. These measures are not always easy to enact. I, for example, lack the resources to acquire high-quality photographic equipment. Much more importantly, I lack the artistic vision and technical skill needed to capture images worthy of the cave. Sometimes I lack the needed patience, and usually I lack patient assistants. Even in the best circumstances I am never fully pleased with my results, but I try. I intend to keep trying, and improving. Find virgin caves. Cavers have engaged in much mourning over lost spelean beauty. Many younger or newer or pedestrian cavers are in no position to understand what was lost, having never seen a truly pristine cave. Touring popular wild caves will never be completely sufficient to describe what the cave was. If you wish to assign value to a great and unique resource, the thing to do is to get out and find it yourself. If you do find or dig open a new cave, consider sharing it, if possible, with people who will really respect and appreciate it. Look at the cave. This sounds simplistic, and perhaps is, but it can be hard to slow down and look, especially when we are excited. It should be recognized that each virgin cave will not be, in the traditional sense, beautiful. This should not distract us from the fact that each will be unique. Learn to see and appreciate more than gaudy speleothems. Look at the mud. While waiting on my brother to dig during the recent survey of a virgin passage, I found myself fascinated by the strata of a little clump of sediment which had settled, layer by layer, and century by century, I expect, and had been left atop a protruding bit of chert as the floor receded. If many people travel this narrow passage, this dirt will be knocked loose and ground into obscurity. See these things. That I looked so carefully at this dirt only in a time of waiting suggests that I may cave too quickly, too blindly, when I have the opportunity. The virgin cave is a gift given to hard workers more often than fortunate tourists, but this does not entitle us to accept it greedily or carelessly. As long as we cherish it, it is uniquely our own, and we keep it at least a little in our memories. If we do not, it is no one’s, and is profoundly wasted. Last edited by GroundquestMSA on Mar 8, 2015 7:37 pm, edited 2 times in total. Re: How to care for things. Oops, wrong month... dunno how that happened. 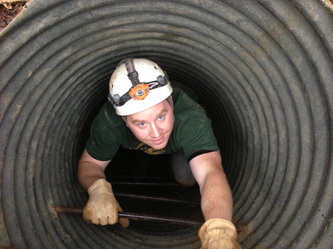 Cavers have abilities to make conservation movements in a number of interesting ways. 1) Documentation. Cavers who document the contents of a cave provide the means for future conservation efforts. If an issue arises which may endanger a cave it is usually necessary to have documentation already on hand to have an effect on topside activities. My quick example is a local quarry that wanted to open on a plot of land. Documentation of the region showed the path of the water underground, the geology of the area, the animals present (including an endangered bat) and a case was made by conservationists that the quarry would be highly detrimental to the water table from which well water and downstream creeks would be significantly impacted. This documentation caused the quarry to be moved to a less detrimental area a few miles away. Documentation can include historic, archeological, geological, biological, etc, etc. 2) Mapping of caves. Mapping of caves is often considered nothing more than a way of navigating, but it can be much more. A good map shows where the cave is relative to surface features. It can show where not to build a large structure. It can also show areas where sewage lines should not be put. It can show karst areas where blasting or digging can have unexpected effects. 3) Identification of pollution. There are many cases where caves become polluted without people on the surface realizing it. By identifying that there is pollution we can help to decrease it. 4) Good will. Getting people interested in caves is an educational opportunity that encourages people to care about conservation. Sometimes just showing people why they should care about caves can get them to change their behavior with regards to dumping or other activities. Explaining to someone how much it would cost to fill in that sink hole may give them a reason to put a fence around it instead of trying to bury it over and over and over again. One confusing method used to “conserve” speleothems is to barricade them behind flagging tape. This behavior either misses the point entirely or is more ambitious in its scope than I am able to appreciate. Do flaggers not realize that speleothems are an aesthetic resource (that is, that they are valuable only because we think they are pretty)? And that protecting them from being diminished through accidental breakage by intentionally diminishing them with unnatural and ugly flagging is both pointless and contradictory? As I said, it is possible that flaggers have the “long-term” integrity of pretty things in mind when they uglify them. But I am uncomfortable with this idea of saving things “for future generations” by losing them to ourselves. Giving away, certainly, a present, in exchange for an uncertain and almost definitely unappreciative future is a sacrifice that I, maybe in selfishness, do not wish to make. Still, I could at least respect such an idea if it was a proven fact that flagging protected anything. I repeat, the thing that enacts real conservation, and the thing that will protect speleothems, is responsible behavior, and responsibility is not dependent on flagging tape. If flagging is unreasonably placed it will be ignored, even by a responsible and caring caver. If flagging is well out of the way, it will serve no use to the responsible and caring caver. Flagging will mean nothing to a vandal. So why do we do it? Maybe in an attempt to demonstrate the value that we place on speleothems. But this is a misguided and, I feel, selfish way to announce our righteousness. Yes, I rekindled that discussion on UKcaving, trying to get a handle on the subject, and included the above excerpt. Cap'n Chris wrote: Thoughtless taping is commonplace - it ought to be an art form, imo, or at the very least a LOT more consideration needs to be put into doing it but it takes time and patience and a lot of effort and goodwill so often isn't on the radar of most people. Why should it be? - simple:- if you want to visit caves you are morally obliged to be actively involved in conserving them; if you don't get this, perhaps you shouldn't be there in the first place. However, it does work. Often very well. With parallel universe theory this is easily proven; it cannot be proven beyond doubt any other way though sadly. We do have caves adjacent to each other where one is actively managed and the other is free access; the FA ones are in a sorry state, the AM ones are near-pristine. Not absolute proof, but pretty darn close. To which I would ask both US and UK cavers: Are any genuinely parallel examples that prove that flagging alone makes a difference? Peter Burgess wrote: The fundamental reason for tapes is to indicate where it is not OK to go, in order to preserve what we can of the cave. It may be that there are many cavers who do not need to be assisted in this way, but equally, there are demonstrably many that do. Tape is the simplest and easiest way to achieve this, by showing where it is not OK to go, and, in the UK at least, there is a widely accepted "rule" that one does not cross tapes. This confuses me, because the success of the measure depends entirely on the visitor following the "rule". If that works, why not make it the rule to stay away from sensitive stuff, and to stay on the trail (which will be visible with or without tape) is areas with sensitive sediments. There are times I imagine, huge and wildly decorated rooms for example, where it may take a long time for a trail to form "naturally" so I can see that tape may have a place. Sam T wrote: A lot of the conservation taping we've placed in bagshawe cavern is purely to direct people though certain bits of cave whereby the most obvious route is the most damaging, and whilst a less obvious, and perhaps slightly more physically arduous route will keep folk off the more delicate bits worthy of conservation. This is a good example I think. Even with my severely limited experience, I have no doubt that much of the flagging placed in American caves does more harm than good. And it seems that UK cavers are some steps ahead in terms of reducing the unsightliness of their taping efforts. UK cavers gave me plenty to think about, but their access control methods and culture and population to cave ratio make British caving an imperfect model for us. I would like to see photos or hear of examples of justified flagging in these States, and I would like to see bad examples too. I think it is important to make a case both ways so that more people might see what they're doing for what it really is, whatever it is. Last edited by GroundquestMSA on Mar 9, 2015 1:22 pm, edited 1 time in total. Speaking to that last example you quoted, I have been in caves where the thing that needs protecting is actually very hard to see, because it's tucked between two rocks, or whatever the case may be. The person that laid the tape may not have realized this beautiful thing was there until their 3rd trip into the cave, so why should we expect newcomers to notice it the first time? Placing tape in these cases takes the need away form future cavers to proceed slowly and with extreme caution in order to constantly judge the path, which is especially useful in project caves where a main route passes through a delicate area, and travelling slowly may compromise the goals of the trip. One more thing I thought of... Most often the people experiencing pristine, flagged caves are experienced cavers. However that's not always the case, and sometimes experienced cavers will take newer cavers to these places under close supervision. Having the tape there makes it easier to inform the less experienced to simply stay on trail, rather than hope their judgement which is still in the early stages of forming, is as good as yours. LukeM wrote: Placing tape in these cases takes the need away form future cavers to proceed slowly and with extreme caution in order to constantly judge the path, which is especially useful in project caves where a main route passes through a delicate area, and travelling slowly may compromise the goals of the trip. LukeM wrote: sometimes experienced cavers will take newer cavers to these places under close supervision. Having the tape there makes it easier to inform the less experienced to simply stay on trail, rather than hope their judgement which is still in the early stages of forming, is as good as yours. This is too, but what am I to make of flagging in areas where there is only one possible route of travel? Oh, I agree that there are often cases of over-flagging. It seems like a lot of times flagging only serves to say, "Hey look, this is a formation that I thought was important! ", when it would be obvious to all but the most dull among us. I also agree that flagging significantly detracts from the beauty of the cave. It honestly looks like trash strewn across the floor and I see it as a necessary evil. I thought of another good use. In the case of rare types of formations or other odd cave-phenomena, even a long-time caver may not recognize that something special is underfoot. For instance, splash rings where a single drip over time has formed a delicate and perfect circumference in the sand or mud. They are faint, and rare, and many would walk right over them if they weren't pointed out. LukeM wrote: One more thing I thought of... Most often the people experiencing pristine, flagged caves are experienced cavers. However that's not always the case, and sometimes experienced cavers will take newer cavers to these places under close supervision. Having the tape there makes it easier to inform the less experienced to simply stay on trail, rather than hope their judgement which is still in the early stages of forming, is as good as yours. This is what we do In a cave that is guarded by my club: we guide 6 times a year groups of 6 persons around in the cave. One guide per 3 guided cavers. The route is almost completely taped. A trip takes around 4-6 hours. And at one spot everybody needs to undress and continue in undersuit. All dirty gear including helmets is transported in bags. An extra light is therefore required. The cave itself is Gates with two steels door. By talkng these measures the cave is almost intact.